This wedding photograph was taken of the bride and groom just after their wedding ceremony at a beautiful cathedral located in Brooklyn, NY. New York City and the surrounding boroughs of Queens, Brooklyn and the Bronx are home to some of the most amazing churches anywhere. 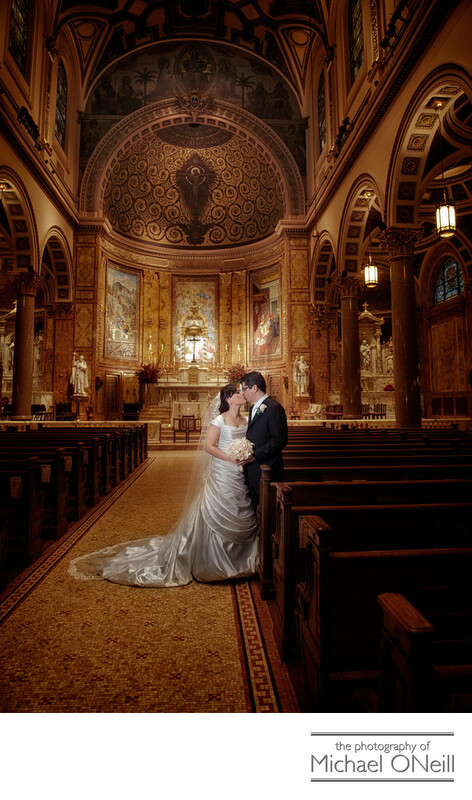 In my career as a wedding photographer I have had the privilege of photographing numerous weddings at St. Patrick’s Cathedral in NYC as well as at The Cathedral of St John the Devine. After church we traveled into Manhattan for lots of fun photos from Columbus Circle down to Washington Square Park including some pictures in Central Park and in the FAO Schwartz toy store. A quick stop was made at The Waldorf Astoria, where the bride and groom were spending their wedding night. Then it was off to their spectacular wedding celebration at The Lighthouse at Chelsea Piers. All in all a beautiful day with tons of amazing wedding photos from dozens of great locations throughout the Big Apple.